Hello Friends!! What a special day - there is so much to share with you all. Firstly, I want to welcome you all to Pinkfresh Studio's blog hop! It is such a privilege to be hopping on board with the talented Pinkfresh team this month as we unveil the gorgeous, new July release! I know you will love all the projects the talented team has created. Here's a wee peek of what I've been working on. But before we get to that, first things first! I want to share how you can get the most out of this fab hop. Aside from gorgeous inspiration, each blog on the hop will be giving away $25! All you need to do is leave a comment below, and then hop along to all the names on the list, and leave comments there as well for even more chances to win. Also, be sure to leave a little note on the Pinkfresh Blog, too, for a chance to win the entire July release! The winners will be posted on Sunday, July 15th on the GIVEAWAY PAGE Please check this page within two weeks to claim your prize! Last but not least, Pinkfresh Studio is offering FREE Shipping for any order $50 and over between July 9th and July 13th, and if you reside outside of the US, $5.50 will be taken off international shipping fees. 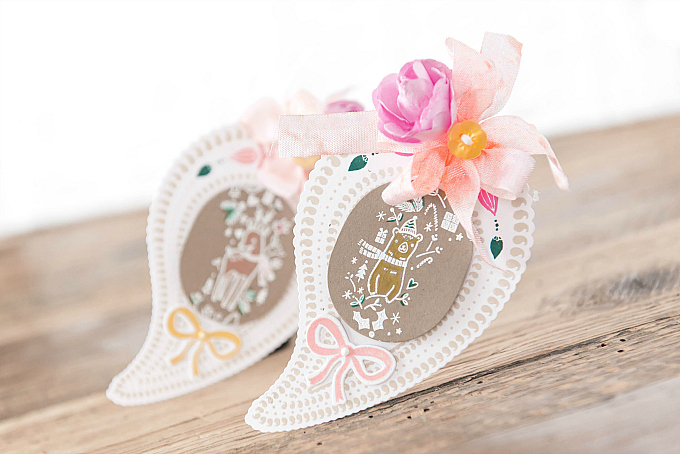 I want to share a few little cards I've whipped up with these adorable, wonderful, new stamps and dies. I am madly in love with Pinkfresh dies. Even the packaging is thoughtful! The smaller die packages each come with their own little magnet backing. How handy is that! And the wire-style dies are created to have an outer edge, so that there is no indent left on the die-cut. I think this is such a clever feature! For today's first card, possibly my favorite stamp and die set of this release! I had so much fun creating with this big, gorgeous paisley motif, aptly named, Pretty Paisley. 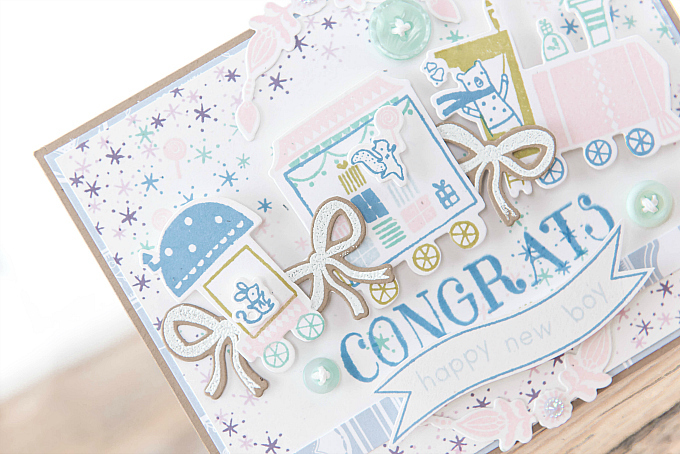 The stamp set perfectly coordinates with the matching dies, for so many fun layering possibilities. I started this card off with a kraft base, to provide a bit of a contrast to the white paisley. Around the paisley motifts, I added the delicate floral designs, stamped in various shades. For the large paisleys, I started off by stamping the large design onto white cardstock cut-outs, and then using the inside die designs to die-cut the center and top of each paisley. I then layered the paisleys onto my card base, and stamped the floral designs into the negative cut-outs, heat-embossing with pretty colors. For the sentiment, I used a stamp from the Pretty Paisley set, and stamped a little design from the Merry and Bright Toy Shop stamp set, creating a little border around the circle. I added some Nuvo Crystal drops, rhinestones, and buttons to finish off this little card. I also combined some of the other stamps and dies from this release to show how well all the pieces work together. 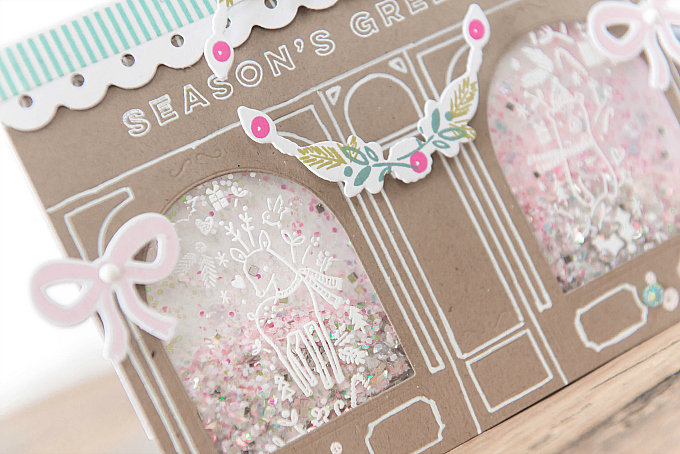 To start the card, I used the Merry and Bright Toy Shop front die, and cut the design using kraft cardstock. I used my white Signo pen to fill in the embossed details. My hand was a bit shaky, so the lines are definitely not perfect, but I think it adds to the whimsy look of the card! I stamped the co-ordinating sentiment at the top of the shop - adore these sweet outline letters! I also created an awning to top off the card, by backing the entire card with white cardstock, that was cut a little longer than the card itself, and folding it at the top with two scored lines, to create a dimensional card. This also allowed me to use 3d foam adhesive between the backing and the die-cut store front, to outline the little windows, so that I could turn the little windows into glittery shakers! I decorated the awning with some striped washi tape, and before adhering it, used an edger punch to get a scalloped edge. But a die would work just as well here. I decorated it with a little makeshift wreath, cut out of the Pretty Paisley dies, and stamped all the detail with Great Joy stamps, along with the pretty little bow. For the windows, I used heat-resistant acetate, and stamped and embossed a couple of the whimsical woodland animals from the Wreath stamp set. I filled each window with a mix of pink, shabby glitter. It's my absolute new favorite, and I have a few little envelopes I think I'll be adding to my shoppe. I'll update as soon as they're available. Here's a side view of the card, to show the dimension. Next up, I have two festive tags, in not-so-typical holiday colors. I love the idea of using these sweet paisleys as the base for a tag. Their larger size makes them perfect for this. I also love that they have a folk-sy look to them, and work perfectly with the woodland animals from the Great Joy stamp set. 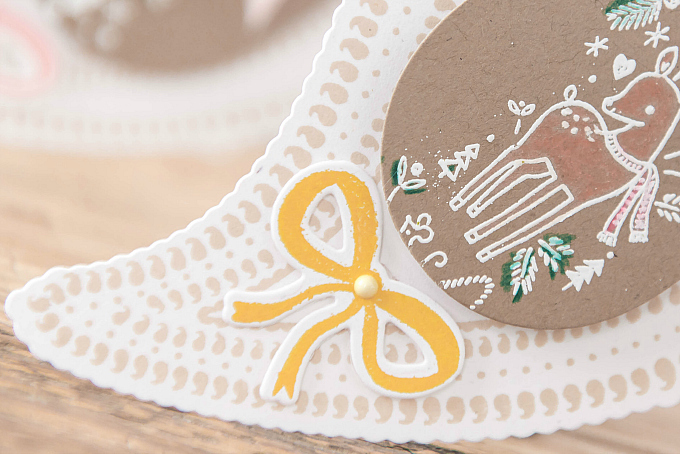 I added a few toppings to each tag, and then layered a little kraft oval (cut using the Merry and Bright Toy Shop die - window cut-outs cut twice to achieve oval edges) with the stamped and embossed images from the Great Joy stamp. I added a wee bow to the bottom of each tag, and colored the animals in whimsical, vibrant strokes with coloring pencils. For something new, I let the color run all over the embossed details, and I sort of like how it looks! 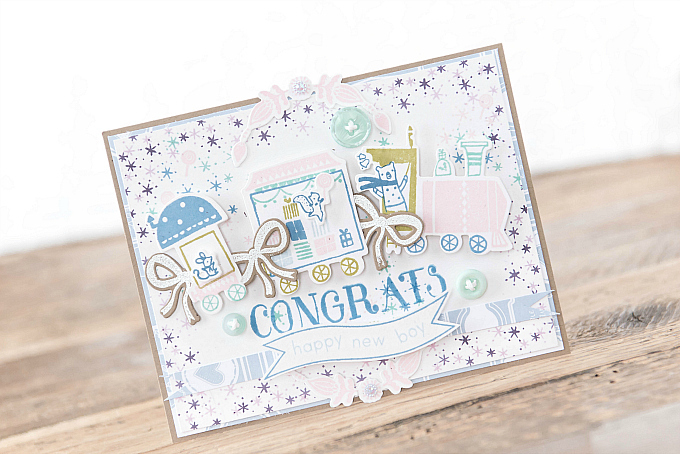 And for my last card today, I have a super fun and whimsical baby card! I love this stamp set! I could sit all day stamping the little bits and pieces together, and adding sweet little creatures to this wee train. I mean, have you seen the little squirrel on her tippy toes holding a lollipop? TOO cute! To start the card, I layered kraft cardstock, patterned paper from the Simple and Sweet collection, and white cardstock for the base of the card. I used the stars stamp from the Train Ride stamp set all around the edges, as well as around the card in a few spots. The little train was so fun and easy to stamp. I started by die-cutting the little pieces from the co-coordinating Train Ride dies, and then alternating colors for all the little elements. The possibilities are endless with this little set....sooo many sweet little details to add. I can't wait to give it another whirl for Christmas cards, Birthday cards, and everything in between. I added little bows from the Great Joy set and a framed top and bottom to the card using the Pretty Paisley set. 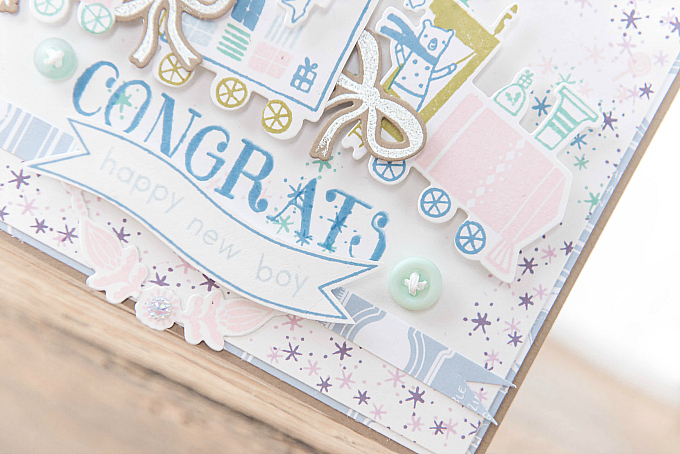 A few little buttons and rhinestones finish off this sparkling, cheery card. Well, that's all from me folks! I hope these little cards will provide a bit of a looksy into the pretty, lovely new sets from Pinkfresh. There is so much more to see on the hop, so be sure to follow along and check out all the fab inspiration. Before you head off to the next stop on the hop, don't forget to leave a little note below in the comments section, for your chance to win $25! Thank you so much for joining me! And a BIG thank you to Pinkfresh for the chance to be a part of this hop. WOW! What fantastic cards. 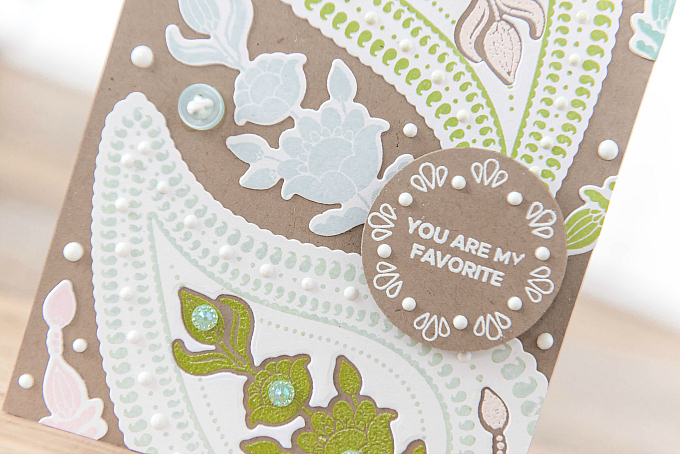 Love the softness and pizzaz of the white embossing powder. Your cards are so soft and lovely ones, inspirational work! I am spellbound! Such beautiful array of cards! Aww! Loved them! Thank you so much for inspiring and for the opportunity to win! WOW! I am so blown away by your beautiful cards!! I just cannot get over how stunning the soft color palette that you chose is... you've inspired me to look at my pastel colors differently now with your beautiful projects... thank you so much for sharing! Such pretty cards! I especially love your paisley card and tags! Oh my, these are all so gorgeous! Love! Oh. My. Goodness. Seriously. I am in AWE of these projects... Your colors are so PERFECT together and I am giddy with delight over how you put these projects together! I had to pin them for future reference... Thank you for inspiring me! 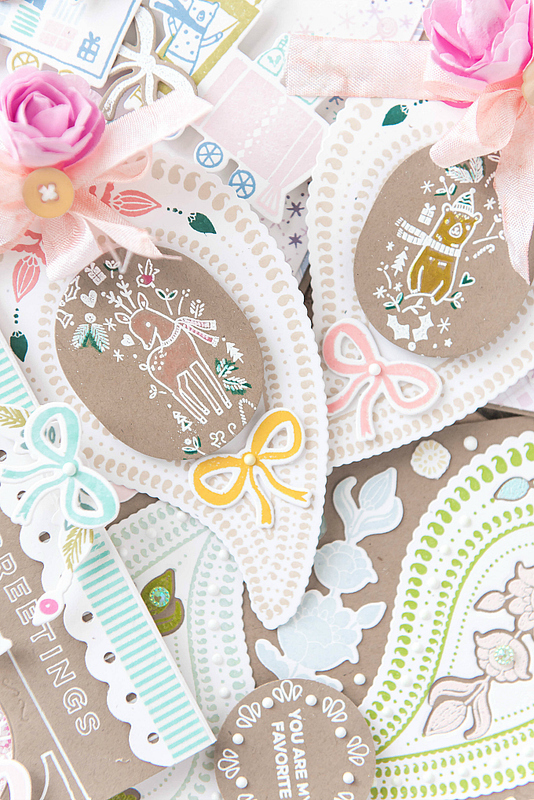 Beautiful cards, i like your style with a lot of craft cardstock and pastel colors! Those animal stamps are adorable! I'm loving all your pretty pastel paisley projects... especially that cute baby train card!! Beautiful cards, you are truly creative! I honestly don't know what to say Ivana! Your projects have blown me away. I think I may have drooled all over my computer screen :) Love, love love the soft colors, the kraft card stock and the white embossing. Perfection! I loved how you used the paisley to make a tag and die cut a portion of the wreath set using the toy store window die, ingenious. Thank you for sharing your talent with us. What a treat to visit your blog! These are all so beautiful, whimsical and just lovely. I adore the sweet tags. And this release - it's WOW! Ivana, paisley was one of my mom's favorite prints - you have given me a wonderful memory, and TONS of eye-candy today! 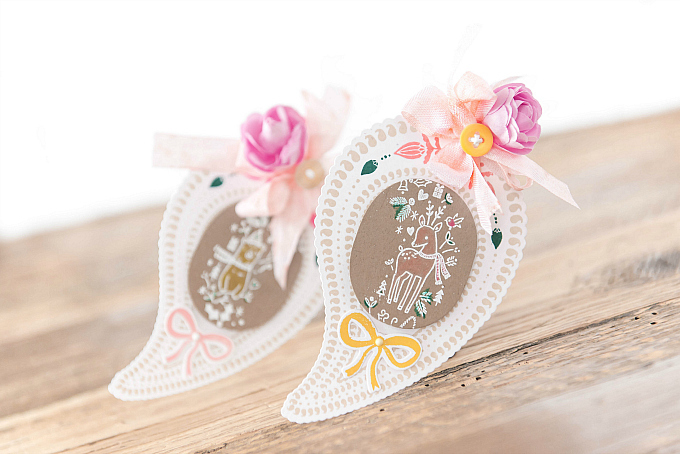 All of your special touches, and embellishments have added to the fun of these new products! Yay Pinkfresh, for inviting you to the party! Gorgeous projects, each with just the right touch of kraft! The cards are absolutely amazing! I love the new release it is fabulous! The inspirational cards for the new release look so well together! LOVE these so much. Thanks so much for the inspiration. Your tags are genius! Oh my goodness, your designs are fabulous! Especially the store front with the shaker windows, I can't wait to try and duplicate that for my own Christmas cards this year. Wow, these are all so stunning. I love the complexity and layers on each one - fantastic. Your cards are stunning ! They are all so inspiring, thank you for sharing your creativity with us. What beautiful unique ideas. Love the kraft background and beautiful colors. Beautiful projects! I was anxious to see someone use the Pretty Paisley set, and your creations are lovely!I also love the window scene you created with the toy shop set! Really love your kraft card and also the kraft tags. So nice! Wow, your cards are stunning! Beautiful work! Gorgeous cards - love the colors. So super cute! The details on the train are amazing!!! I love the delicate look of your cards and tags. So pretty! What beautiful cards, Ivana! You gave us so much inspiration in this post. I love them all, but the tags are such a great idea! Thank you so much! Stunning cards! Such beautiful layers and dimension. 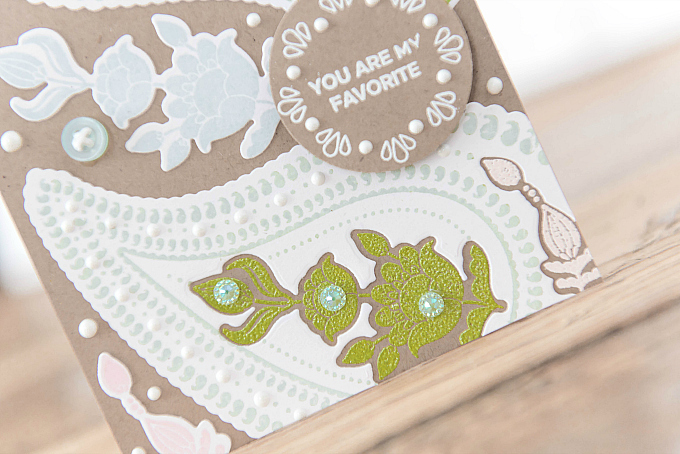 I love the soft color palettes with the kraft cardstock - so striking. I am blown away by what you created! You are so talented! Your cards are so magical and they made me smile. Oh my goodness these cards are just so absolutely stunning! The soft pastel colors with kraft just tug at my heart! I especially love how you used the paisley as the base for the tags you made... so inspiring and creative! Such gorgeous cards and tags. Love the Christmas theme. the paisley is great! awesome inspiration!! Love the kraft card stock as a starting point. The colors you chose are perfect and the designs of the cards and tags are beautiful and unique! Beautiful cards! I don't know how long it takes to make your cards, but they are works of art! I am very happy you are a part of this blog hop! 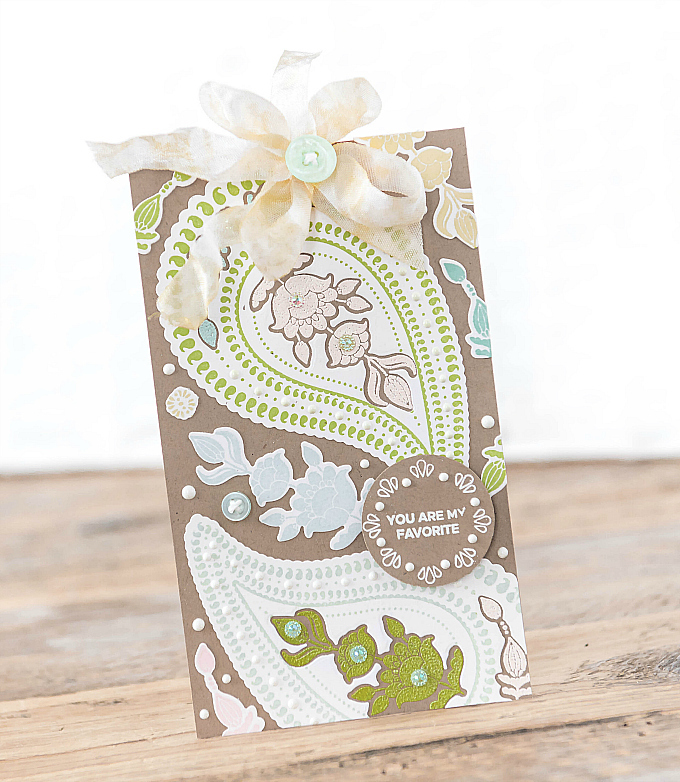 The paisley really works well as a non-traditional tag and I adore that baby card!! 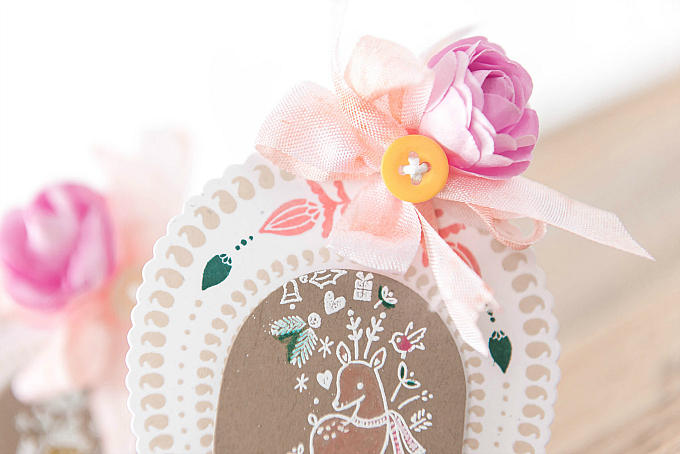 So many fabulous card projects! I don't know where to begin. I guess my favorite is the storefront with the embossed reindeer in the window - so clever. Wonderful cards! So many cute projects! I think my favorite is the first card. Very pretty! Congratulations Ivana, so well deserved!! These are incredible little works of art! They all have your special touches and layers that flow together perfectly. I especially love those sweet tags!! Your cards are just amazing! All those little pieces on the train and how you turned the paisley die cut into a tag are fabulous. The storefront is my favorite though! Just beautiful! Love your little shop windows!!! All are amazing but that baby card tho!!! I could totally see the recipient putting this card lovingly in a baby book to be cherished forever. I absolutely adore your cards, so many sweet details, amazing work! Wow! What a great collection of cards! They are all FANTASTIC! Your storefront card looks like you had a lot of fun decorating it and "bringing it to life." I love the idea of a baby card using these products and making a paisley shaped tag ---- so creative!!! I love your color choices. Your use of ring on tag was really smart! Wow! These are all so pretty! My favorite is the tag set! That tiny deer looks so pretty and captures something magical about Christmas! I LOVE that! Oh my how talented you are! I love all the details! Just beautiful! Fabulous work! You can tell you were having fun with the new stamps and dies. AMAZING creations! 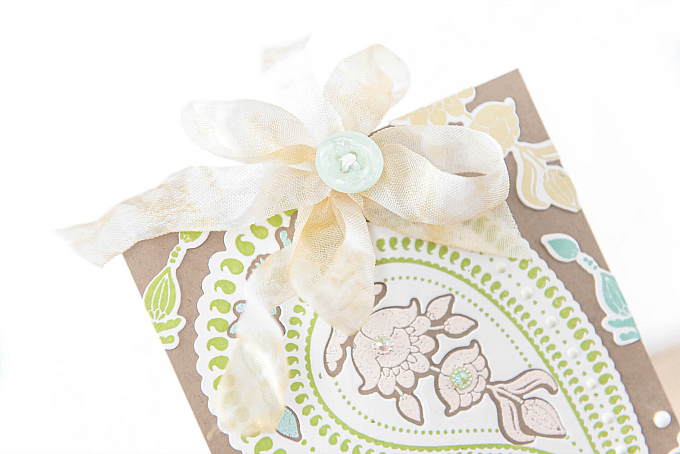 I just love all the beautiful soft colors against the kraft paper! Just soooo pretty and Shabby Chic!! Oh my goodness gracious !!! Your creations are absolutely amazing !! And the color combo is so sweet !! Congratulations !! So cute. Love the use of kraft and the paisley. Gasp. I adore the pastel colors with the Kraft cardstock. So beautiful. I keep staring. TOTALLY STUNNING!! I love how you used the stamps on your cards. I especially love the paisley tags with the reindeer. So fun! !